Breeding News From Around the World: Is There a "Height" Gene in Horses and Ponies? Height is an important trait in ponies and in horses. Sport horse breeders often look to increase the height of a smaller mare; pony breeders often want to produce a "large pony" but not cross the line to produce a horse. It's something we'd like to control, whether we want larger or smaller. Wikipedia photo, article on sincle-nucleotide polymorphism. So is there a single gene that dictates horse height? The short answer is "nope." A recent study of ponies in the British Isles determined that there is no single area of the genome for height. There are 222 "highly significant height-associated SNPs...". A SNP (pr. 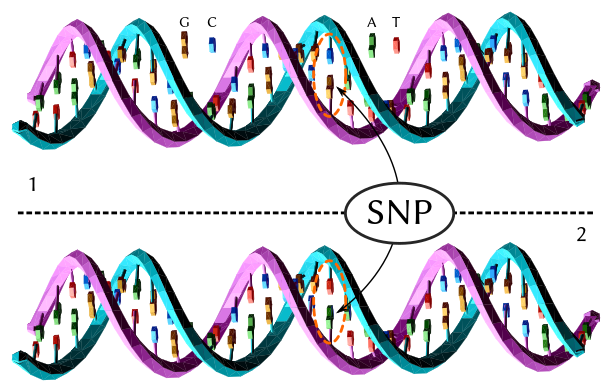 snip) is a variation in a single nucleotide that occurs at a specific position in the genome. 222 SNPs mean 222 places in the genome that can influence variations in height. To read an abstract of the published research, click here. To read an analysis of the research, by Kentucky Equine Research, click here.